The Aspen Music Festival and School has been internationally acclaimed since its start in 1951, but for those looking for a more casual, less expensive option with top-flight acts, nearby Snowmass is THE place to enjoy summer music in the mountains. Down-to-earth Snowmass, one of four winter sports areas for the Aspen Skiing Corporation, is just 15 miles, or 20 minutes by car, from its glitzy neighbor, Aspen. While Snowmass also has its share of enormous mountain estate homes, it attracts a more jeans-and-hiking boot crowd and less of the Prada and Louis Vuitton-consumers so inherent to Aspen. Snowmass’ musical offerings are also more casual than Aspen’s – and much less expensive (even free). The Snowmass Chili Pepper and Brew Fest, celebrating its tenth year in 2013, was rebranded as the Snowmass Mammoth Fest to honor the prehistoric bones recently discovered in the area, drawing international archaeologists and paleontologists to the Snowmass excavation site. The Mammoth Fest is a full weekend of live music, held in early June each year, featuring specialty chili and microbrew tastings and competitions, all held at the Snowmass Town Park. 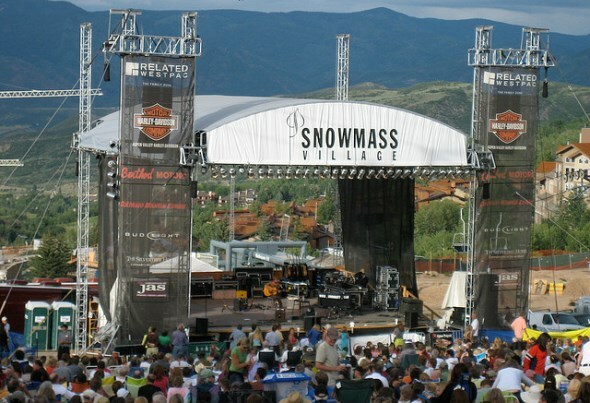 The Park is also the site for the Jazz Aspen/Snowmass Labor Day Festival, which features such stars as Keith Urban, Jason Mraz and Journey in its 2013 lineup. Mammoth Fest features 10 bands that perform over the two-day, two-night weekend. The Jazz Aspen Snowmass Festival is held in June and July in the Benedict Music Tent in Aspen, featuring world-class artists. For example, 2013’s offerings included Jackson Browne and Pink Martini. Festival attendees flock to the delightful “lawn parties” held before the concerts on the grass outside the tent, with leafy towering shade trees, dining on gourmet selections sold from local food carts or their own picnics. Looking for a free event? Head to Snowmass on Thursday nights for the Summer of Free Music on Fanny Hill. Get there by 6 p.m. to fully enjoy this beloved community tradition – and if you feel like dancing to the music and the sunset, you’ll have plenty of company. The Los Angeles Times called it the best free music series in the Colorado mountains, and as many as 3,000 fans attend each Thursday.